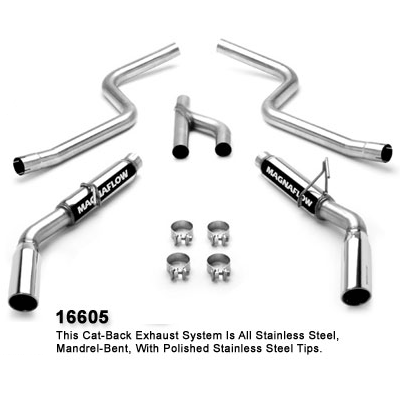 Magnaflow Performance Exhaust is all Stainless Steel, Mandrel-Bent, Cat-Back Exhaust System With Polished Stainless Steel Tips. Fits 2005-2009 Mustang V6 4.0L. No one else gives you the bold clean styling of our Aftermarket Dress Ups, Suspension and Performance Parts for your American Muscle Car like UPR Products! Click Here for Instructions Click Here to Listen to the Exhaust and see Dyno Chart Fits these Vehicles: 2005 2006 2007 2008 2009 V6 Mustang Roush & Saleen Vehicles.